Hungry but don’t know where to eat? Here are our favorite places to eat and drink in Forest Hills. 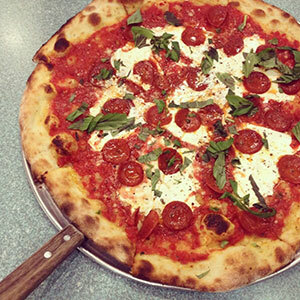 Founded in 1993, Nick’s Pizza is a local favorite serving up crispy, thin crust pizzas and calzones in Forest Hills, Queens. They don’t sell pizzas by the slice – pies only – so come hungry (or bring friends!) Everything is made-to-order, so you can get as creative as you want with toppings. And, one word of advice, take the cannoli! It’s a must-try dessert here, and it tastes heavenly. If you’re looking for a lively local Mexican restaurant serving strong margaritas, stop by 5 Burro Café. This staple in the Forest Hills community serves up tacos, enchiladas, and quesadillas that are authentic, delicious, and wonderfully satisfying. There will be a wait on the weekends, but it’s worth it. This gastro-pub is a go-to spot that can really do it all: lunch, happy hour, casual drinks, dinner, brunch, etc. 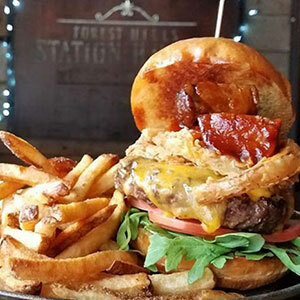 Forest Hills Station House has 16 craft beer taps, a huge whiskey menu (there’s over 120), craft cocktails, and excellent comfort food. The neighborhood spot has the perfect casual atmosphere to chill with friends, and because of its location, it’s also a great spot for drinks or food before (and after) a concert at Forest Hills Stadium. The bar also has TV screens showcasing their beer on tap with descriptions down to their origin and alcohol content. As for the food, order the mac and cheese or the Decadent Burger that comes topped with braised brisket, Boursin cheese, fried onions, wild mushrooms on a brioche bun. Memories of Shanghai is a new spot within the Forest Hills food scene. This Chinese restaurant is known for its modern interpretation of classic dishes and its insistence on only using high-quality fresh ingredients. It's a true a true mom-and-pop operation: Xueling Zhang is the chef; his wife runs the dining room. Their daughter assists with operations, while her husband works in the kitchen. Must try items include the scallion pancake with sliced beef, soup dumplingsand pan-fried noodles. Thank you for the shout out. And for great recommendations! All fine establishments. Forest Hills strong!